In Shizuoka, a man in his 90s who was found lying outside his home was confirmed dead at a hospital. Another senior, 86, died at a hospital after collapsing near his home. 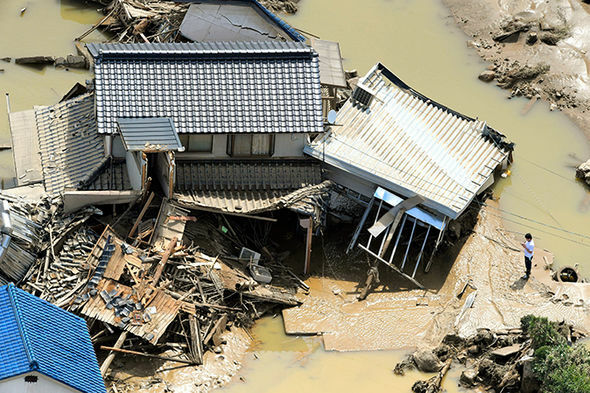 In Okayama, where more than 1,000 volunteers showed up to help clean up flooded houses and remove debris caused by torrential rain and mudslides, at least 48 people were treated for heat-related maladies. Of the Meteorological Agency's 927 observation points nationwide, 613 logged highs of at least 30, and 161 logged temperatures over 35. The agency warned that temperatures will remain high throughout the week. The heat-wave is also hampering rescue efforts after almost half a year's rain fell in Japan in just ten days this month.